最近看了一个ppt, Fault-Tolerance in Avionics Systems. Fault Tolerance: 指错误检测, 损坏评估, 故障隔离以及从错误中恢复的能力. 现代Fault Tolerance主要关注两种Fault, Byzantine Faults 和 Common Mode Faults. Voting is one method of using multiple FCRs, where a voter takes output from the FCRs and decides the correct output. Exact: output values must match bit for bit. Approximate: values must be w/in a certain range of avg. Mechanical: system physically creates correct output. E.g. Each component provides a fraction of force needed to move output. Your messengers must be Byzantine Resilient also. 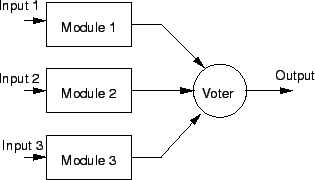 Inputs, such as samples of sensor data, can also use a voter. Most aircraft provide redundant sensors. Transmission media can use voters and multiple connections. Voters are components! They must be extremely reliable or the system is pointless. Voting is often used to vote on the state of a component. 3 systems operate on input. Majority value or average wins. The voter can optionally shutdown and reconfigure bad components. Created and used before Byzantine Generals’ paper, though it solves the same problem. Still widely in use today. This is not voting. Uses simpler hardware or software to reconcile outputs. Command / Monitor: command is primary CPU, monitor merely checks output of command. Primary / Backup: same as C/M, but backup computer can take over as primary. Hot Swap: backup always has same state as primary for instantaneous replacement. Two pairs of each processing component, both executing on all input. In each pair, both components send their output to simple hardware comparator. If it finds that output differs, switches over to other pair until first pair reconfigured / replaced. Used in lots of old interplanetary satellites. Programs need to be written without knowledge of hardware resilience. Even operating systems are unaware of Byzantine Resilience, instead software just assumes that Byzantine Errors don’t happen. 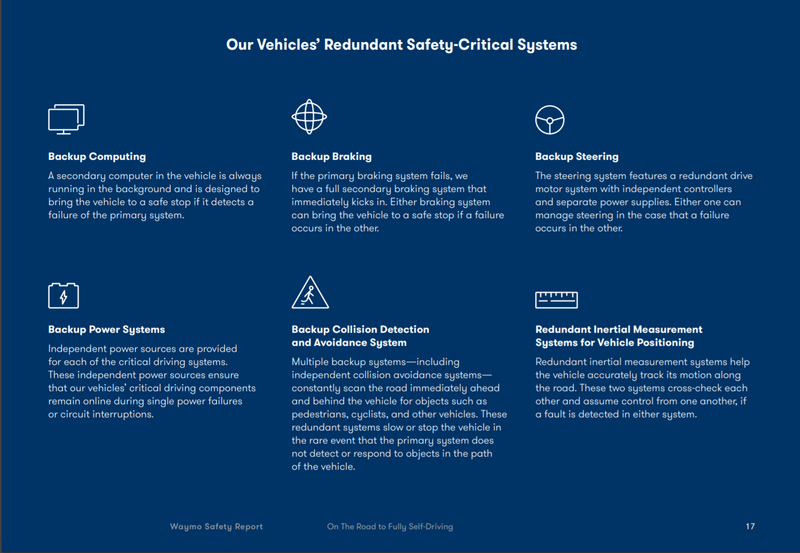 The hardware and software used to detect and isolate faults, mask errors, and reconfigure components are kept separate form any operational software. If bitwise comparison with other components fails, declare failed component faulty. Most voting systems work this way. Thresholds / Reasonableness: check that component output is within a certain threshold. Built-in Test: components check themselves for failures. Power-on BIT: checks itself at startup. Think POST. Continuous BIT: components check themselves periodically during slack time. For components to work together smoothly, their clocks must be synchronized. Clocks themselves must be Byzantine Resilient (to a certain degree). 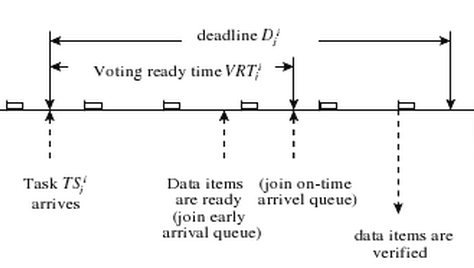 Voting used to determine the specific time. After time determined, push out to all Fault Containment Regions. Remove faulty component at the cost of redundancy. Replace faulty component with hot swap or spare, costs more in power or money. Transient Errors: vast majority of errors encountered do not repeat. Keep rechecking value. If it persists, fault is permanent. Reconfigure something. The buses (such as communication or power, if you don’t have independent generators) must also be Byzantine Resilientish. Similar techniques would apply with small changes. E.g. Basically means test the system rigorously to find problems. Fault Insertion: fake faults to make sure you system can handle them. Watchdog Timers: task which occasionally runs and verifies system state. Hardware Exceptions: when invalid hardware operation found, throw and catch hardware exceptions. Runtime Checks: software exceptions, etc. Program Checkpointing: periodically save state, reload state when an error is found. Impractical often. 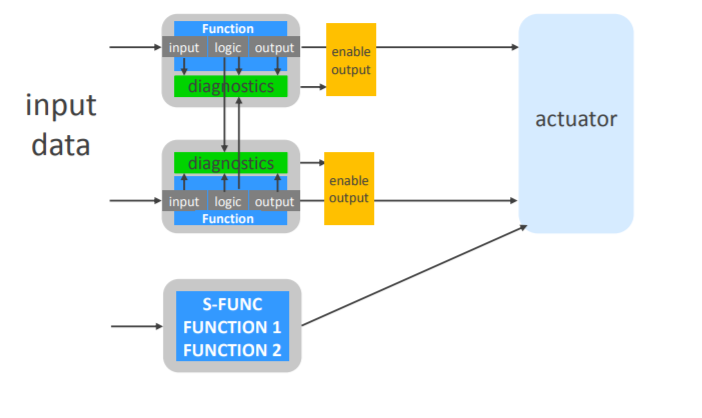 Surprise, the solution involves executing tasks at different modules. Apollo had a computer with rigorously verified code. No permanent failure was ever recorded. 备用运算, 备用制动, 备用转向, 备用电源, 备用碰撞, 冗余惯性测量. 因此这里需要再加入针对performance limitation的考虑.当然重点不放在如何找到以及改善performance limitation, 这个是扩大到整体系统安全范畴了. 主要关注的是, 针对环境超出performance limitation后的容错处理. 严谨的流程中, 使用何种解决手段, 使用到什么程度, 是根据失效概率和安全等级来决定的. 不过作为单纯的YY, 不可能做到这种程度, 因此这里只简单使用下列规则. 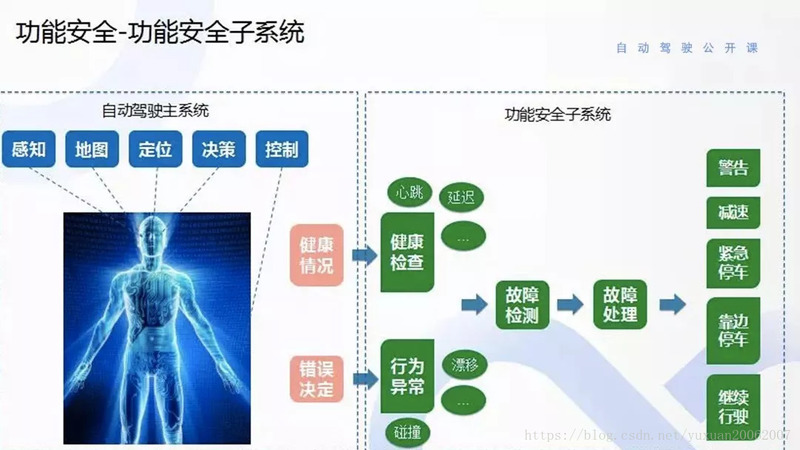 如果一个模块, 在其出错的时候, 基本都能检测出来(error detection), 那就使用双重冗余. 不过除了障碍物识别, 一些边角的感知需求, 比如说红绿灯识别/信号灯识别/车道线识别, 是无法基于雷达的数据获取的, 则有必要考虑在摄像头部分做硬件冗余. 物理隔离的备份安全平台, 在百度apollo和waymo的相关透露信息中都有提到.备份安全平台在硬件设计上主要是能采用更可靠的硬件/驱动程序, 使用已经被广泛验证的平台和技术, 不像计算单元那样受限制于计算能力. 如此, 为整体带来Design Diversity. 按经验来说, 计算平台硬件出现失效的概率应该是不大的, 做双冗余即可. 或者不做冗余关系也不大, 如果有备份安全平台的存在. 以百度apollo为例, 其Trajectory Control, Longitudinal/Lateral Control是直接在计算平台内做的.此处分到ECU上, 主要是看所有车厂放出的架构里, Control都是在ECU上做的, 比如说BMW. 当然他们这么做, 多半是为了直接复用ADAS上自适应巡航, 自动泊车的模块. 我们这里这样选择, 主要是出于Diversity, 成熟设计稳定性, share ability的原故. 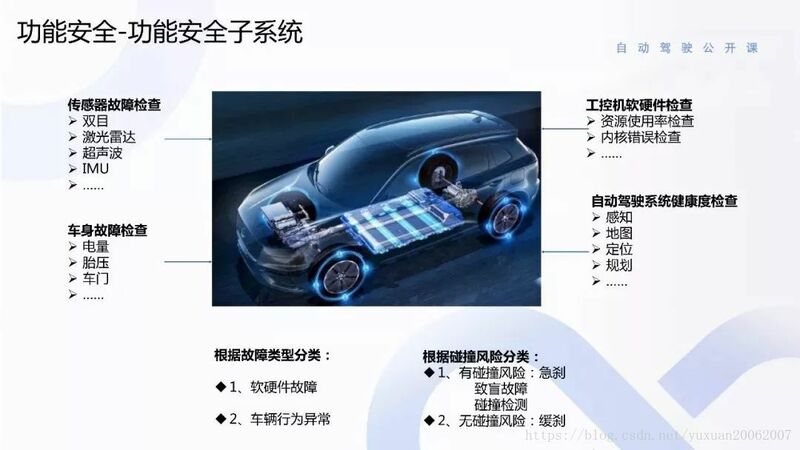 更多的算力, 改善算法的Performance Limitation. 以Cruise的自动驾驶为例, 使用了5个激光雷达, 16个摄像头, 20多个毫米波雷达. 数据量不是单计算平台可以承担的. 另外, 在哪里做vote也是个没有考虑清楚的问题. 可能考虑分布式投票, 放置于计算平台之上(采用中断的实现方式, 在实时Linux上的延迟应该是1ms内的). 在实现逻辑上和计算平台Guardian基本不会有太大区别, 也是基于RSS/安全距离来做.只是鉴于备份安全平台的设计原则和计算能力, 数据来源一般都是用2D激光/超声波这种false/true数据, 或者毫米波雷达/MobileEye这种直接输出tracklet数据, 所以效果必然比主系统差.主要是覆盖万一情况. 如上, 一直讲的都是容错,除了熔断防撞/Guardian算是针对Performance Limitation的防线. 但是熔断防撞/Guardian逻辑本身也只是简化版的算法, 一样有他自己的限制以及限制于传感器.